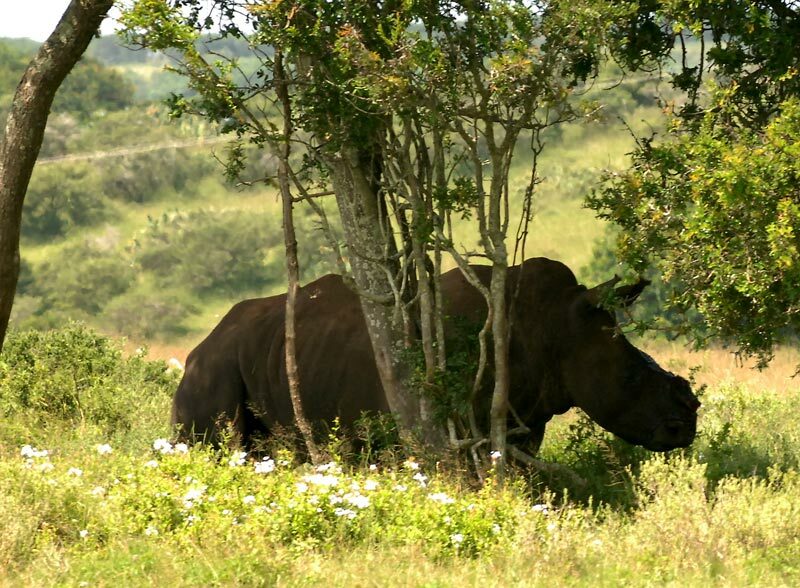 A PREDICTION earlier this year that the Eastern Cape should brace itself for a spike in rhino poaching came true when one animal was killed and two others critically injured at Kariega Game Reserve near Kenton-on-Sea. The attack in which all three rhinos’ horns were hacked off has left reserve staff shattered while popular Kariega general manager Alan Weyer described the acts as “cruelty beyond any normal person’s imagination”. This is the first assault on rhinos in the province this year and the fourth at Kariega since 2009. In January reliable intelligence obtained by anti-poaching intelligence coordinator Rodney Visser pointed towards the Eastern Cape becoming the next target for poachers. The de-horning of the white rhinos – which a veterinarian confirmed had first been tranquillised – was suspected to have been executed with a panga. The chances of survival for the two remaining rhinos have been described as “slim”. When Weekend Post arrived on the scene on Friday one of the two surviving rhinos was battling to stay upright, staggering around before collapsing again, and local veterinarian William Fowlds was in the process of administering antidotes. While the rhinos themselves, according to Weyer, are worth between R300 000 and R400 000 each, the horns fetch millions of rands on the black market and are smuggled to Asian and Middle Eastern countries where they are ground into powder and used as an aphrodisiac or to “cure” diseases such as cancer. Weyer said Kariega management and staff were devastated by the attack and the cruelty the two bulls and one cow had to endure. “I struggle for words to describe this. What kind of person has the capacity to do this?” Weyer said. Fowlds believed the surviving two rhinos had been tranquillised before being attacked. “The chance of survival of the other two is very slim. One of the main problems is that we cannot give them sedatives, which means they are in extreme pain and will be for a very long time if they survive,” he said. The latest attacks brings the national total of rhinos poached in the past two months to 83 – leaving experts to believe rhino poaching could reach record heights this year. Hawks spokesman McIntosh Polela confirmed his unit was investigating the attack. This is a shortened version of an article that first appeared in the print edition of Weekend Post on Saturday March 3 2012.